The Russian government will free nearly 100 whales held in tiny enclosures in the country’s far east for almost a year, according to officials. 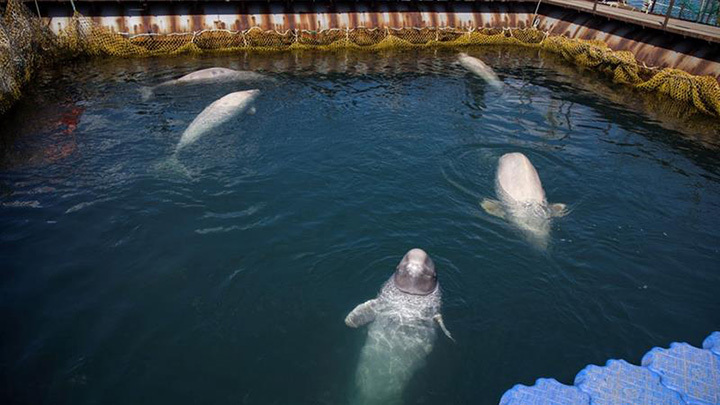 Photos of the whales, kept in a bay near the Sea of Japan port city of Nakhodka, first appeared last summer after they were caught illegally by companies which planned to sell them to marine parks or aquariums in China. Animal activists voiced their concerns, including Leonardo DiCaprio and renowned oceanographer Jean-Michel Cousteau, and shared a petition on social media to release the whales. The petition received nearly 1.5 million signatures. On Monday, Russian authorities announced that all of the captive whales, 10 orcas and 87 beluga whales, will be set free and released back into the wild. “An official decision has been taken to release all the animals into the wild,” said Oleg Kozhemyako, the governor of the Primorsky region. Although Russian authorities agreed that the whales were held in cruel conditions, they said it was difficult to release them into the wild without harming them. “Scientists from Cousteau’s team and Russian scientists will decide when and which animals to release,” Kozhemyako added. A special rehabilitation facility for whales will be set up under the agreement, with conditions as close as possible to their natural environment. “I know it’s a lot of work, but I have no doubt that we are going to succeed,” Cousteau said.